Dazzling sparkle, gorgeous design and the perfect fit - this 9 carat white gold bridal set combines unique shapes with stunning diamonds. With a pear-shaped cluster of diamonds set at two levels and diamond-set twisting shoulders on the engagement ring, paired with a diamond-set wedding band, both created to fit together on your finger with comfort and exquisite style, this bridal set will guarantee a 'yes' whilst taking the stress out of finding the perfect rings. 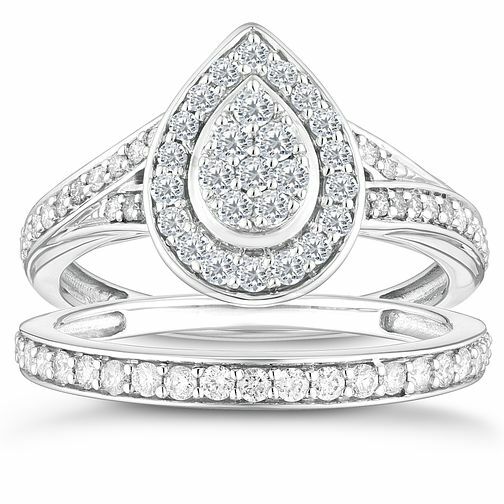 This bridal set has diamonds totalling 2/3 carat in weight.